In this wonderfully tongue-in-cheek, fast-paced adaptation, writers John Nicholson and Javier Marzan, of Peepolykus, have joined forces with director Gemma Bodinetz, to turn metatheatre into an extreme sport. Four actors argue over how to do justice to Flaubert’s novel on stage, but they have very different ideas of what’s appropriate. Having explained their framing device they then embark on a journey which is more of a scenic detour than a complete derailment of the story. Conor Murphy’s set is effectively a blank slate: acres of blackboard on which the actors sketch props in chalk. There are also tiers of sliding doors and crinoline chandeliers. Jack Knowles’s lighting aids the rapid scene changes, while place and time are clarified by a Gallic score from Peter Coyte and Amanda Stoodley’s attractive period costumes. It’s a long show but there’s a lot of story to tell, and much of the incidental business is necessary to cover multiple quick changes, with the four-strong cast playing over 20 parts. It’s all deftly directed by Bodinetz, for whom this has clearly been a labour of love. 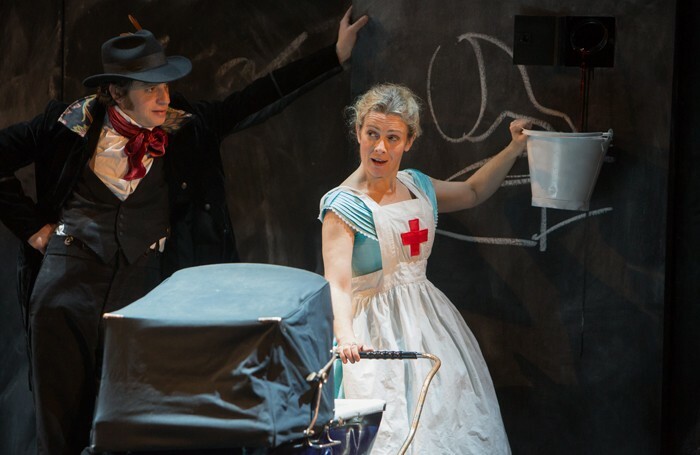 The cast give breathlessly energetic performances, with Emma Fielding’s dignity in the title role a perfect foil to the slapstick physical comedy of Marzan, Nicholson and Jonathan Holmes. Despite the lunacy of it all, The Massive Tragedy of Madame Bovary! is actually a remarkably lucid telling of the story, referencing an impressive number of key plot points, and almost offering an alternate ending, before a raucous epilogue reinforces the theatrical unreality again, closing things on a high note. Zany but faithful stage reworking of Flaubert’s classic novel.